The middle day of my most recent trip found me in San Jose. So far in my experience, this general area is home to some of the most challenging courses around. 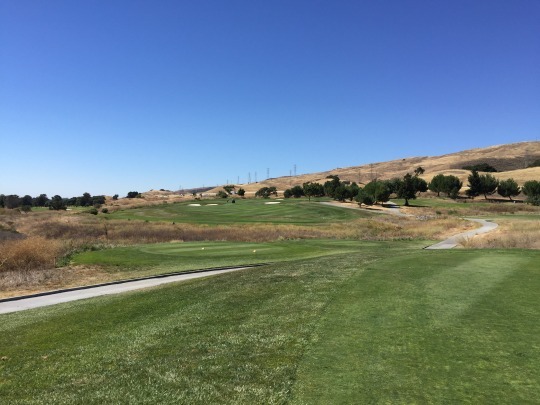 Last year, I played Cinnabar Hills and Eagle Ridge (in nearby Gilroy). 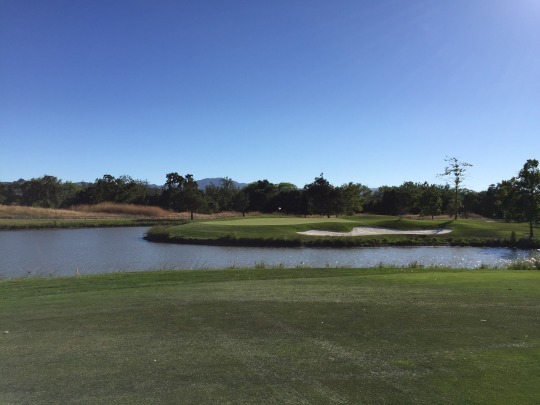 Both courses were very beautiful, yet extremely difficult. 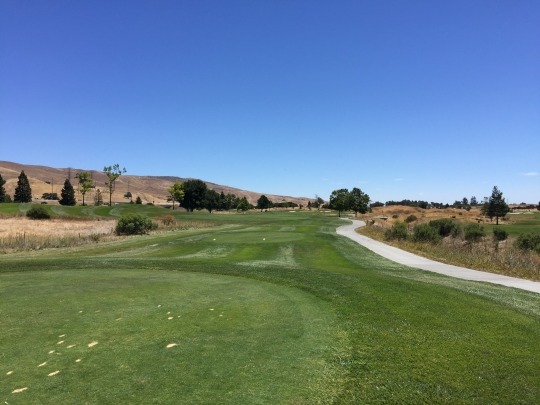 The Valley Course at Coyote Creek was a little more basic in design, but still no pushover with plenty of length and stiff afternoon winds. 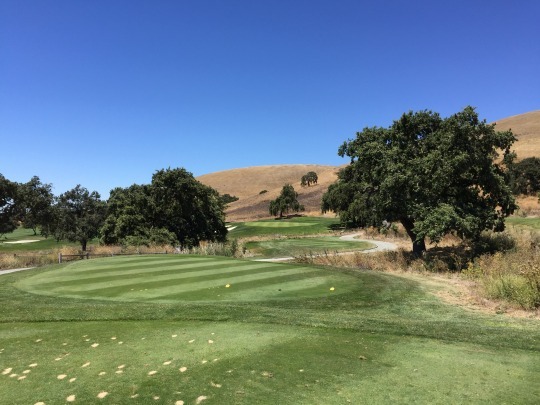 I haven’t yet played CordeValle, but it also looks like a pretty stern test based on what I saw during the U.S. Women’s Open. 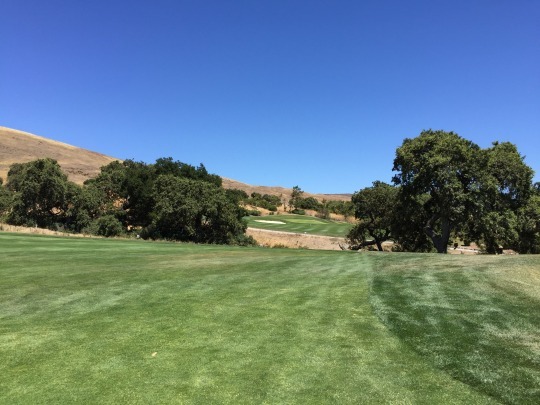 This trip, I was back up there to check out a couple more courses that I knew would also not be easy: The Ranch Golf Club and The Tournament Course at Coyote Creek. 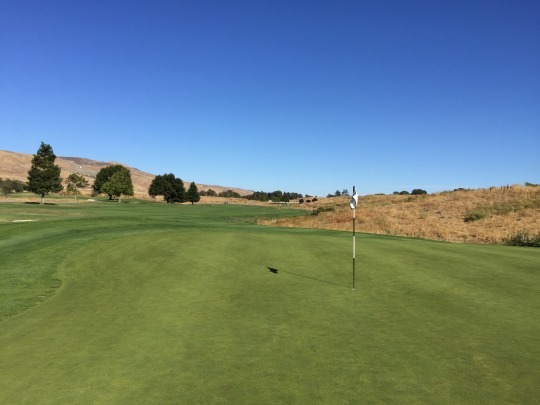 As I’ve played around here on previous trips and read reviews on Greenskeeper.org, I knew this course had a pretty tough reputation. 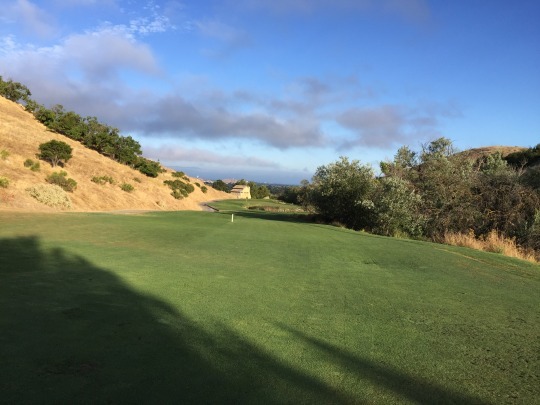 Even my playing partner at Poppy Hills (who was from Los Gatos) remarked that this was the course nobody liked to play. It reminded me of the comments I always hear in Southern California about Champions Club at The Retreat. 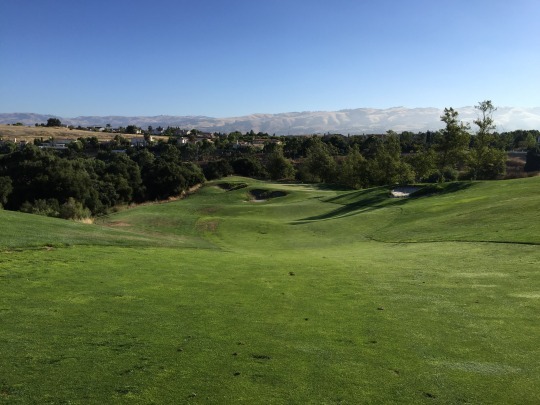 It’s the course that South Bay Area golfers love to hate. Needless to say, that only made me more intrigued. 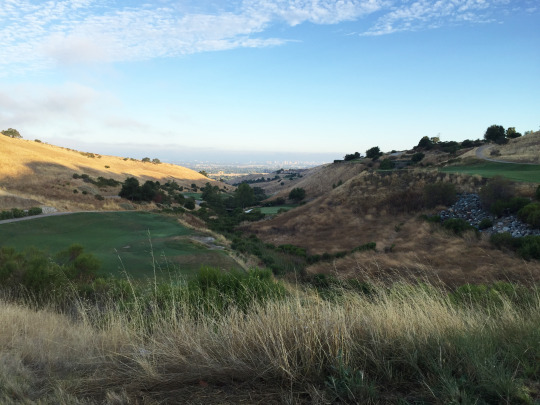 I’ve seen parts of the course from the freeway, so I knew it was a dramatic setting up on the hillside. 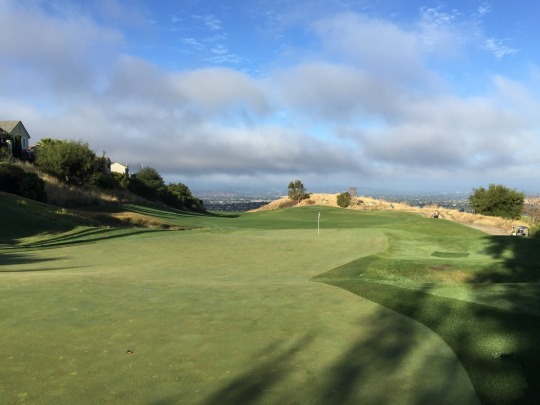 Until you see it in person, though, it’s hard to describe just how visually stunning this course is. It was designed by Casey O’Callaghan and Wade Cable. 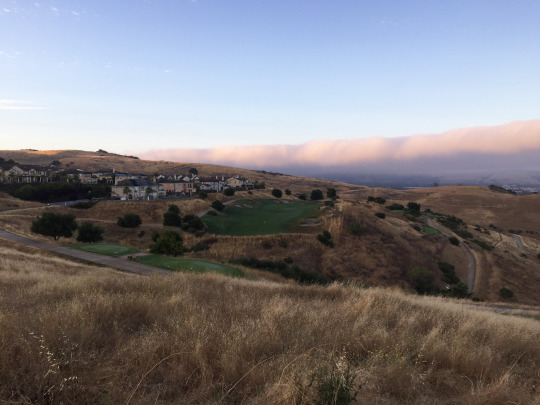 The Ranch strikes me as a course/community that was developed in the height of the golf and real estate boom of the late ’90s, when courses kept trying to top each other with more and more elaborate designs. In other words, there are a lot of things to like about it. Yet, it is pretty tricked out and I can easily understand why it may turn some people off. 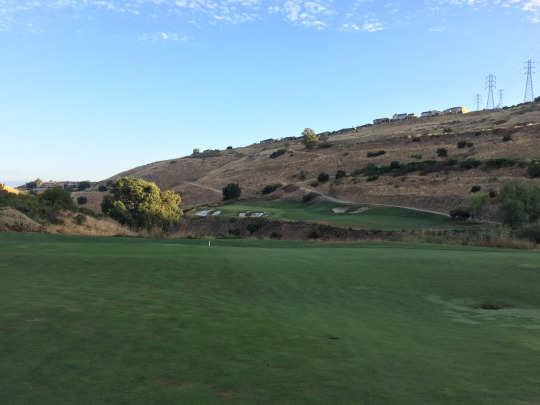 I had booked a 6:30 tee time for Saturday morning at an early bird rate of $57. I booked directly on their website. However, when I checked in I was not in their system. They were nice enough to honor that early rate, but didn’t necessarily have a spot for me on the tee sheet. The girl in the pro shop just said to check with the starter and they’d fit me in somewhere. The starter was fantastic and made special effort to get me out early. Ultimately, he decided to just let me go out first ahead of everyone else because there were no groups to pair me with. I was going to suggest that because that’s what I ideally wanted anyway, but I didn’t have to. It was his idea and I gladly took advantage of the offer. 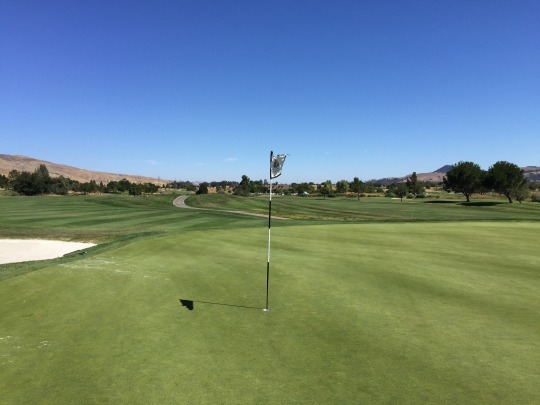 Normally, it will take me two hours or less to play a course by myself with a cart. The round at The Ranch took me about 2:40, which is a testament to the difficulty of this layout as well as the spread out routing. Seriously, there is a bit of a drive between almost every hole here. 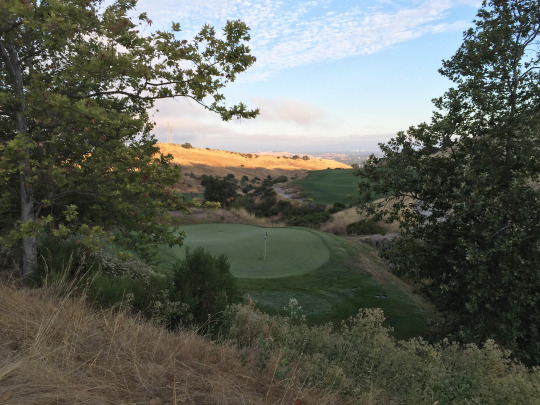 The cart paths wind up and down hills, and there were a couple spots that seemed like at least a five-minute drive between one hole to the next. It’s pretty crazy. 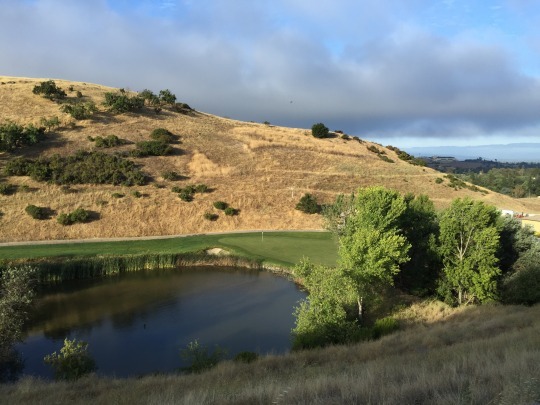 The Ranch is target golf to the extreme, especially on the front nine. 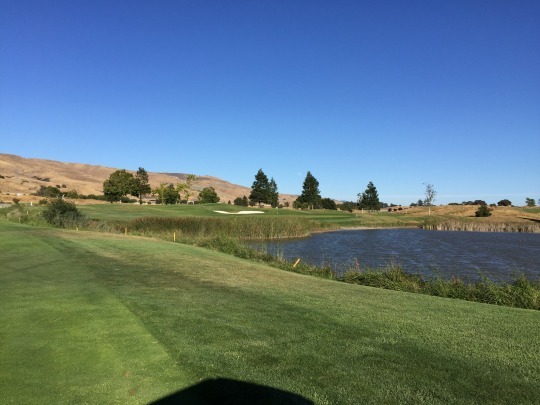 I opted to play the blue tees at 6,305 yards. That’s normally an ideal yardage for me, but the rating/slope for that set is 71.0/142. 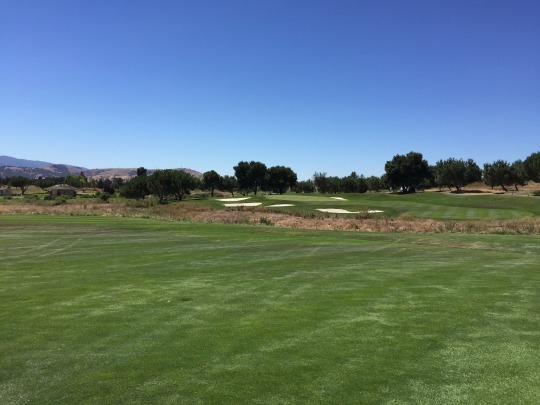 The white tees were only 5,724 yards (68.7/126). I think that is way too big of a gap, so combo tees or an intermediate set might be a good idea here. The blues are going to be too much for most players, but it seems the whites would kind of neuter the course and make every tee shot a lay-up. 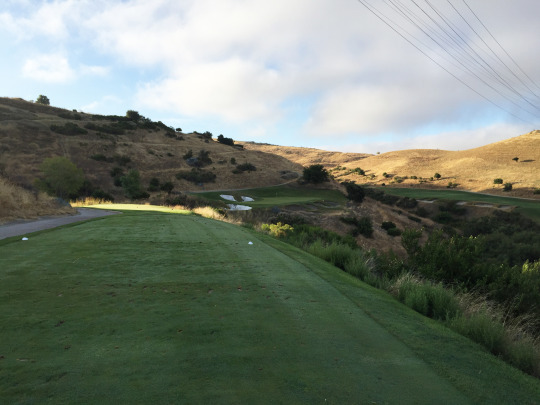 Then, there are black tees (6,656 yards – 72.7/148) for the truly sadistic folks! From the blues, the first tee shot woke me right up. I should mention it was unseasonably cold (under 50 degrees I’d say) and really windy first thing in the morning. 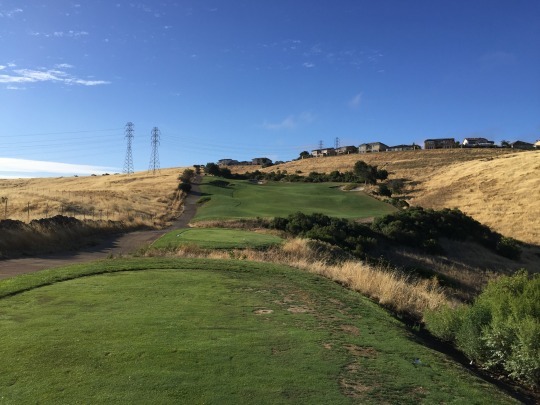 So, teeing off on the first hole with about a 180-yard forced carry to a pretty narrow-looking fairway was an intimidating way to start the round. 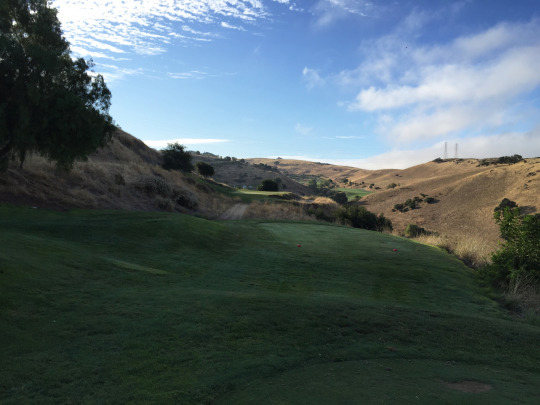 The carts here do not have GPS and I didn’t get a yardage book, so I was just playing based on what I could see from the tee boxes. That made the front nine here even more tricky. I’m certain course knowledge goes a long way on this layout. The front nine does not really let up with target-oriented holes. 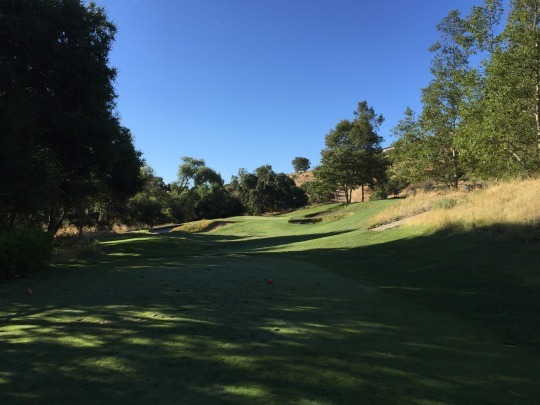 Almost every tee shot is a forced carry as you play your way along the rim and down into a steep canyon. Then, there are quite a few forced carries on approach shots, too. 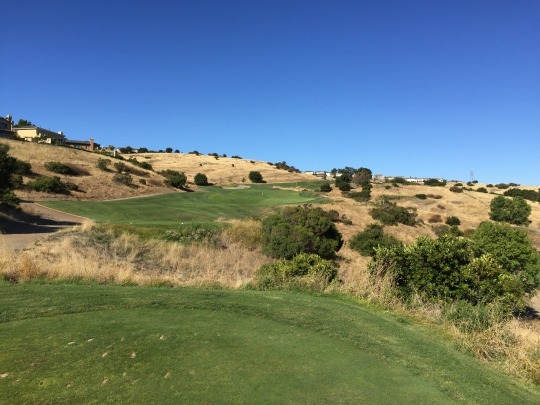 The fairways are more forgiving than they look from the tees, but are still pretty tight and require a great deal of accuracy. 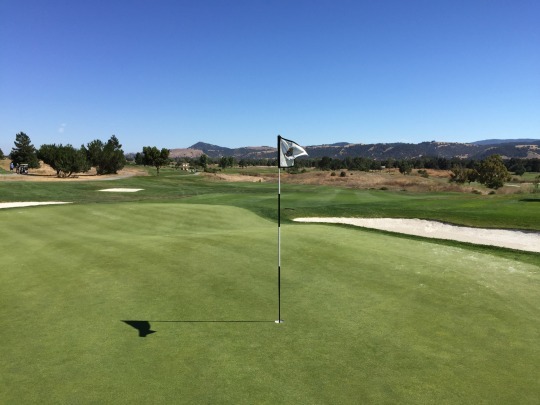 The greens are big and feature plenty of undulation, as well, so once you are on the green you still have some work to get the ball into the hole. 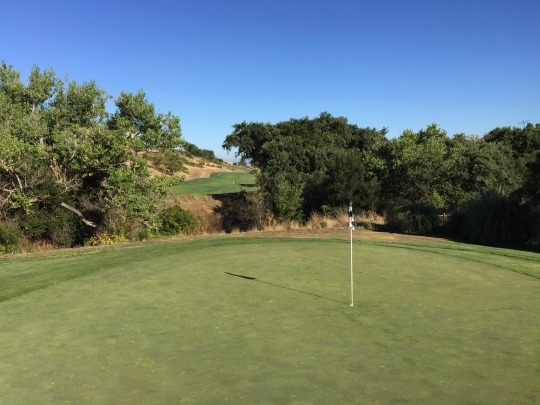 I think with proper shots and knowledge of the green complexes, you can put together some birdies on the shorter holes while you are just hoping to survive some of the longer ones. You just have to execute really well on every shot. 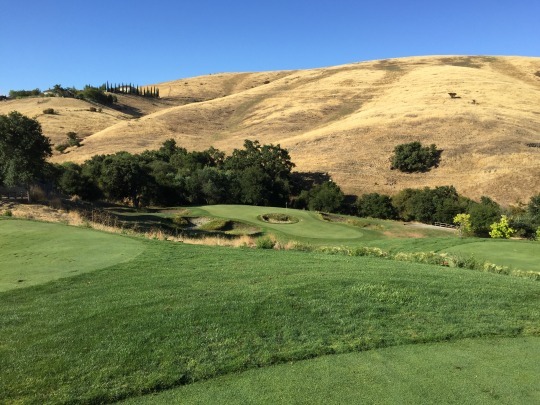 The back nine starts with the most dramatic hole on the entire course. 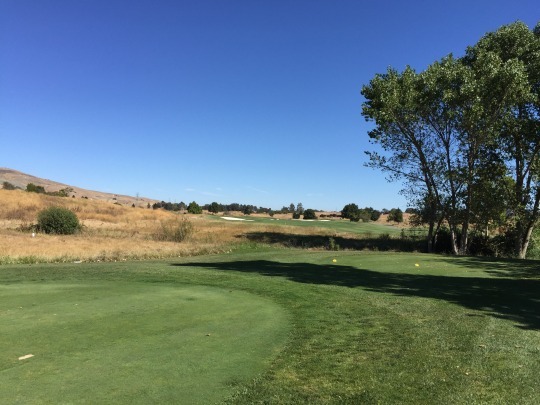 The 10th hole at The Ranch is a dandy. 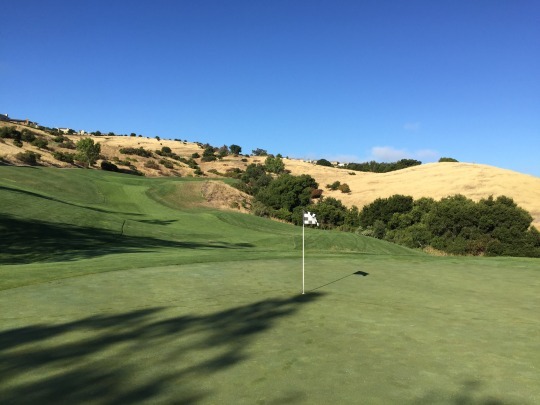 It is not long at 320 yards from the blue tees (343 blacks, 288 whites), so some people may go for the green. 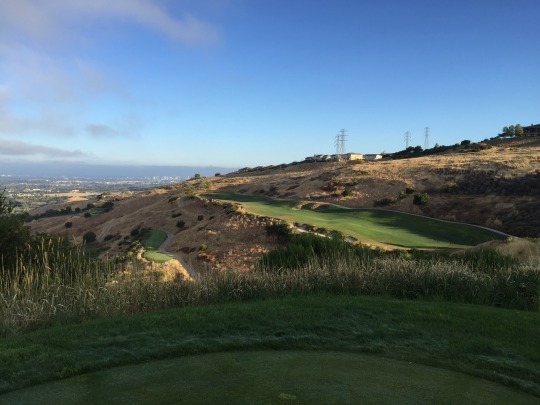 It plays straight downhill and the tee offers a spectacular view of San Jose. I’m not sure how far the drop-off is, but it’s pretty significant. For those of us unable to drive the green, the fairway looks like a postage stamp (to borrow from Royal Troon’s vernacular) with a hazard on the right side, hill/OB on the left and a creek that cuts diagonally across between the fairway and green. This is where GPS or course knowledge would have helped me as a first-time player. This is a hole I’d like a few more cracks at. It is tricky, but really cool to look at, and that pretty much sums up what The Ranch is all about. The rest of the back nine actually softens up a lot, at least in comparison with the front. The forced carries aren’t as severe and things lay out in front of you a little better. It is still not easy, but it definitely feels less intimidating after the really tricked out front nine. The other signature hole on the back nine is the par-3 15th. Both par-3s on the back are really short and fun, but the 15th has a bunker in the center of its green a la Riviera. This is not the first time I’ve encountered this design element, but it was still exciting to see when I rolled up to the tee box—especially because I wasn’t aware of it beforehand. This was also the first time I actually hit into one of these crazy bunkers (not on purpose), so I was kind of giddy to play the actual shot. Well, I should have been. Unfortunately, the bunkers at The Ranch were atrocious. I am not sure what they are doing here, but it seems like they are letting most of the sand traps throughout the course be reclaimed by nature. They are not regrowing grass to fill them in. Right now, they are just hard-packed old sand and whatever weeds are coming up from the bottom. I didn’t see anywhere that noted the bunkers should be played as GUR, even though they probably should be at this point. This ruined what would have been a fun little shot on the signature hole, because I basically had to try and pick it clean from the hardpan instead of playing a blast from the sand. I hope they clean out these bunkers someday and put in fresh sand. There are some really cool bunkers throughout the course and they are integral to the hole designs, so it would be a shame to let them go. I can see if they are making an effort to soften the course\, but leaving them filled with weeds/hardpan and not marking as GUR actually makes them more difficult. They would need to be filled in completely. Other than the terrible bunkers, the rest of the course was in good condition overall. Some tee boxes were a bit beat up, but I never had a problem finding a level stance. 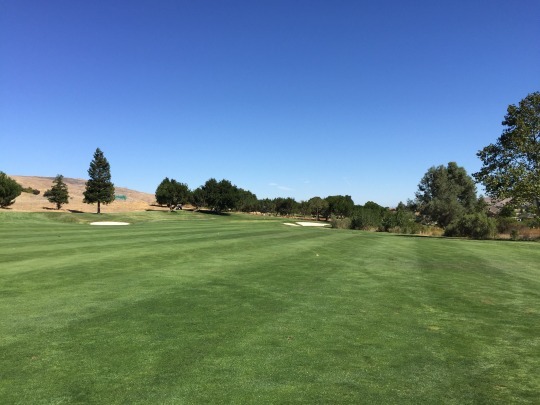 The fairways were very good in general. A lot of tiny dead spots scattered throughout, but they rarely impacted anything. The rough was a bit spottier, but still quite lush for the most part. I did notice the back nine fairways and rough had much more consistent coverage than the front. However, the worst fairway on the course might have been the 17th. It was really chewed up. The greens were soft and rolling a little slow with the morning dampness, but had good surfaces for putting. The Ranch is certainly not for everyone. 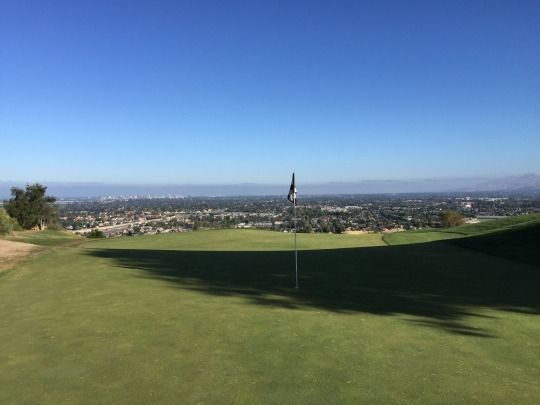 If I lived here, I could see coming out here once or twice a year to challenge myself, but it wouldn’t be a course I’d choose to play regularly. The designers certainly achieved something that is very dramatic and aesthetically stunning from 1-18. However, they may have gone a little overboard trying to trick it out too much. 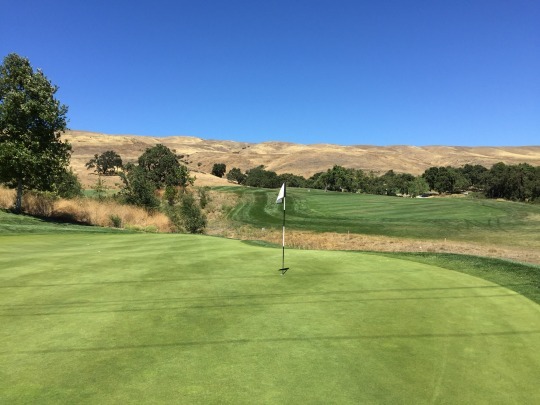 Compared to other area courses (including local munis), the rates at The Ranch are pretty fair and good deals are easily found. And I’d recommend everyone check it out at least once to experience quite a roller coaster ride of a course. Love it or hate it, it’s not a layout you will soon forget. 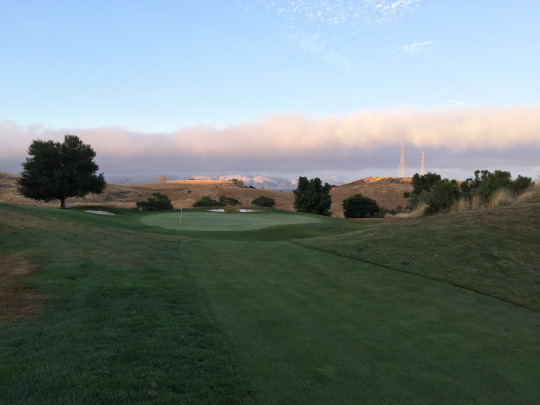 Last year, I was able to play the Valley Course here. The Tournament Course was closed for some renovation to the bunkers. I believe Tournament is currently considered semi-private, with certain days and times reserved for members. 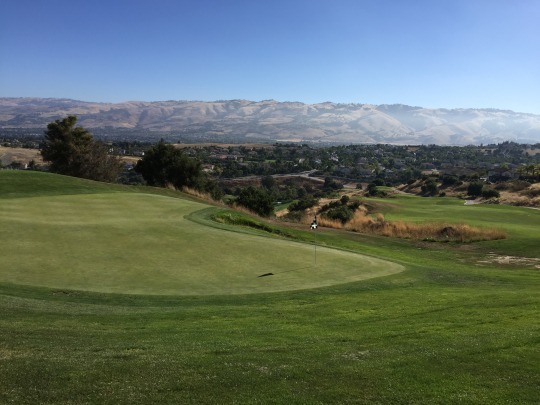 It seems they are working to build up their membership in order to someday make this a fully private course while leaving Valley as the public option. The Valley Course was decent, but I knew Tournament was the star at this Nicklaus Signature facility and I was looking more forward to it. 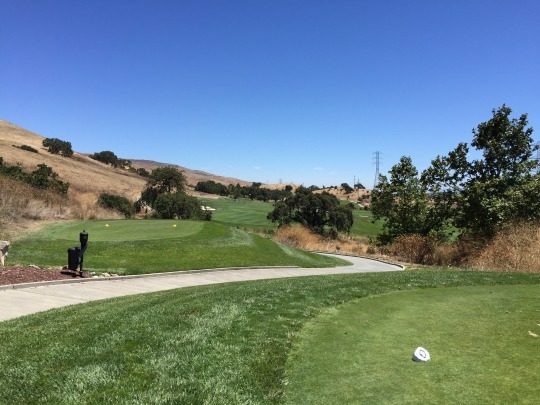 I had a 1:00 tee time and was joined by a couple of GK members from Northern California. We were supposed to have a fourth, but he never showed up. We teed off on time, though it was really busy out there on a Saturday afternoon and there wasn’t any marshal to help move things along. The round took 5 hours and 20 minutes to complete, so that was rather disappointing. It ultimately cost me one more short course I hoped to play afterward. That was probably the only negative on the day, though, as I enjoyed this course a lot. 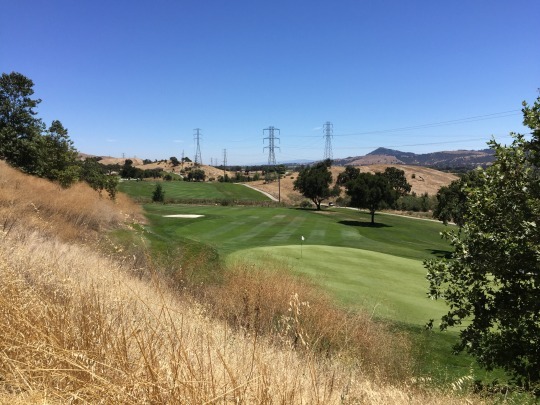 Most of the course is on the south side of the freeway alongside Valley, so these holes have flat terrain to work with. 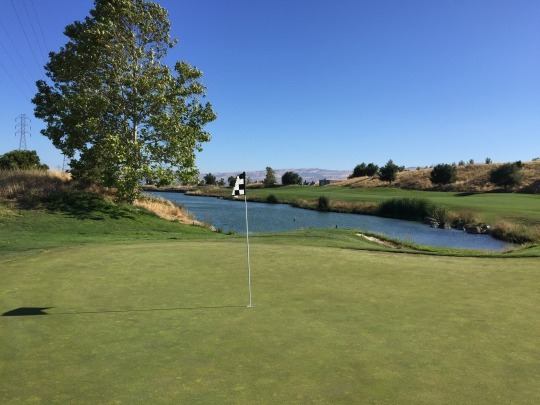 The finishing stretch of 17-18 is really great with big water hazards and creative hole designs, but otherwise the holes on this side play similar to what you find on Valley. 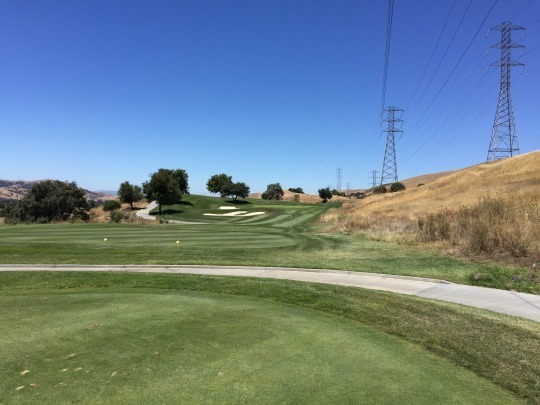 Then, the best part of the course is the stretch of holes 2-8 located on the other side of the freeway. 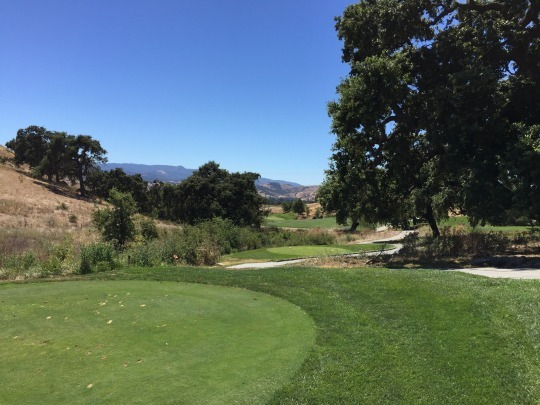 These play along a small hillside peppered with old oak trees, so this stretch has a more interesting look and layout. 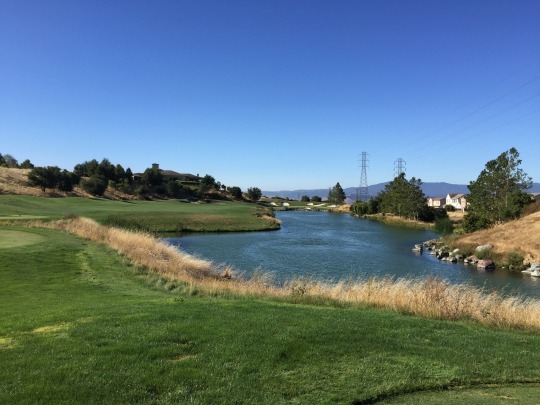 Small creeks criss-cross both halves of this course, as well, so they come into play a lot as hazards. As expected, I really enjoyed that stretch of holes. 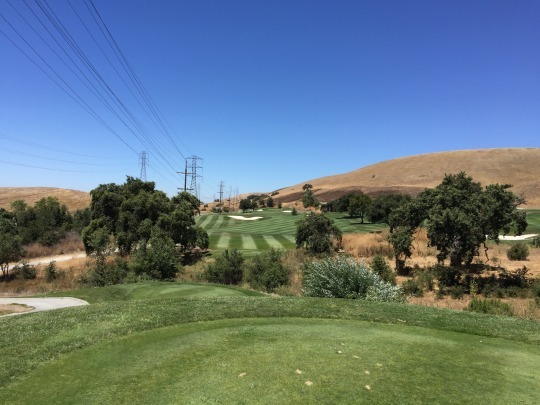 It’s definitely prettier and more demanding on that side of the freeway, but my favorite hole on the course was probably the 17th. This is a great par-5 with all sorts of risk/reward options. 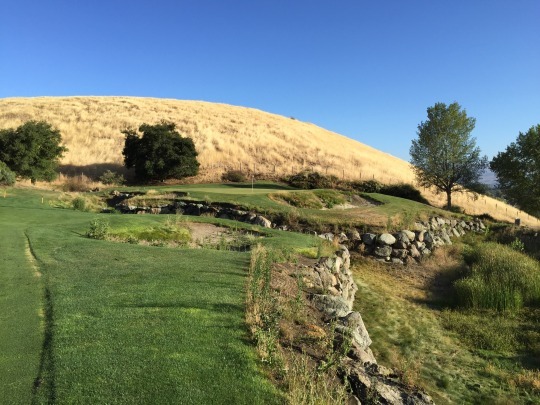 The tee shot is pretty straightforward as long as you avoid the creek up the right and OB/road way left. 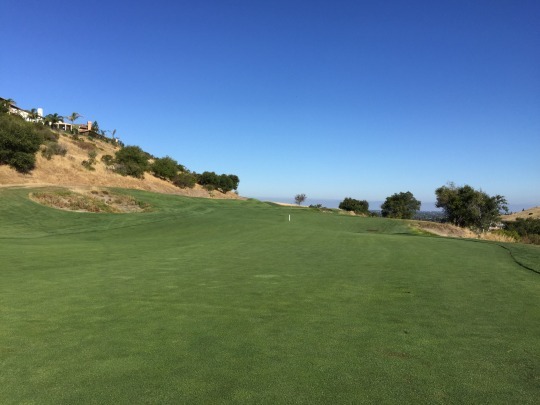 Long hitters will want to position their drives up the left side of the fairway. Then, the next shot gives everyone some options. 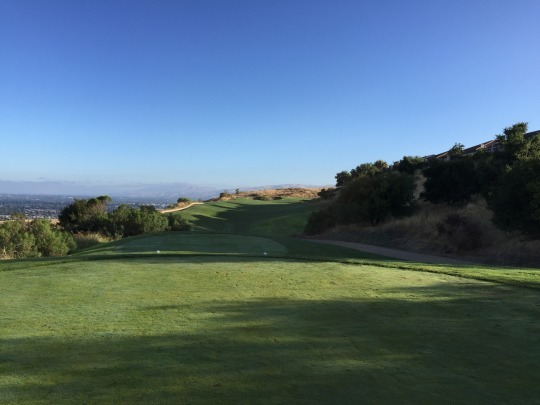 If you are laying up, you can continue to play up the left side of the fairway, which will leave you with a better angle but a longer approach. Or, you hop across the creek to the secondary fairway, which will leave a shorter shot in. Others will choose to go for the green in two. The green is basically a peninsula with water surrounding the front and both sides, so long is your only room for error. I just really liked all the options and strategies this hole provided. As a Nicklaus design, I didn’t think the greens were overly crazy by his standards. There are a few really tricky ones with big slopes and shelves, but nothing that felt too silly. It was really windy in the afternoon, and it sounds like that’s almost always the case here. 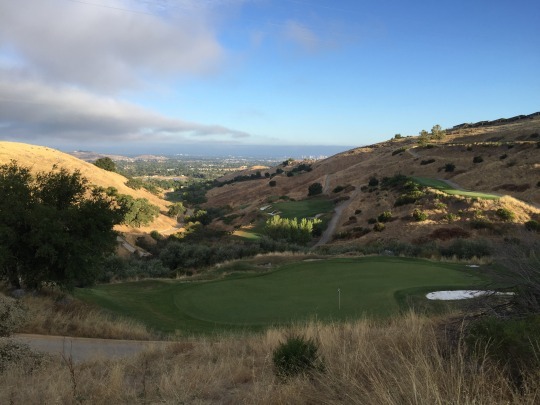 Almost every hole on this course plays directly downwind or upwind, so that really affects your distances by a club or two each way. 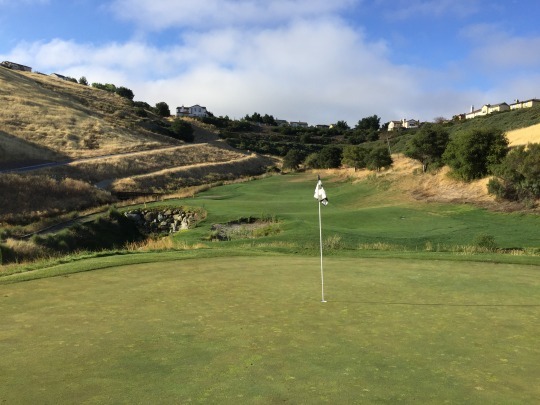 With strong winds, some holes play really, really long while others play much shorter than the yardage on the card. 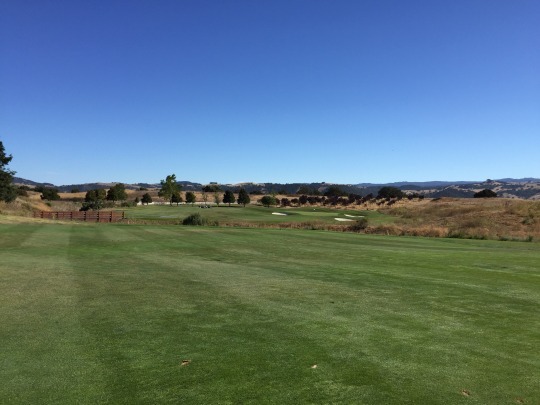 The Tournament Course was in excellent condition, and it was the best conditioned course I played on this trip. It was really nice. The tee boxes were great. 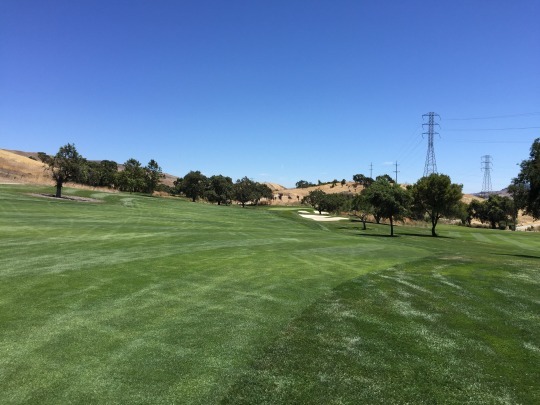 The fairways were lush and nicely kept. I always had great lies. 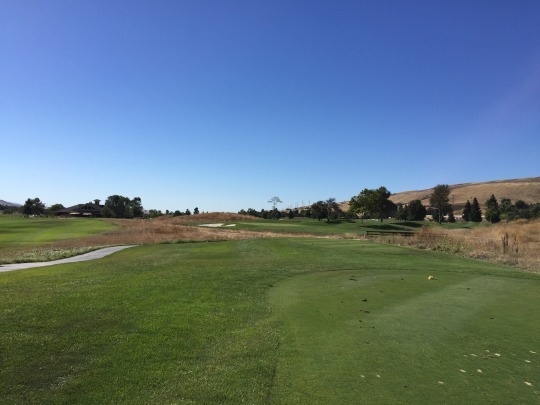 The main cut of rough was generally very good, and there are the deep native areas that will basically result in a lost ball if you hit it there. The bunkers were phenomenal with soft white sand. They were some of the nicest traps I’ve played in a long time. The greens were also nice, rolling true at ideal speeds. 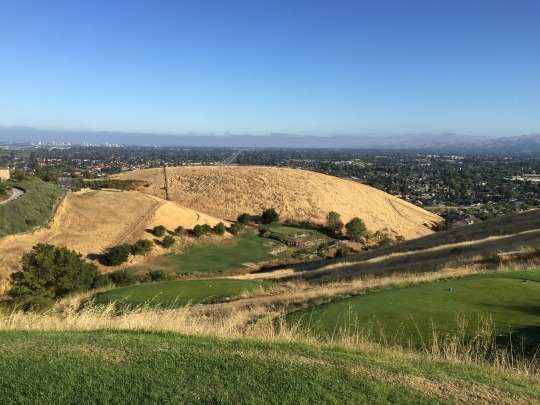 The location of Coyote Creek is on one hand convenient, right off the freeway. 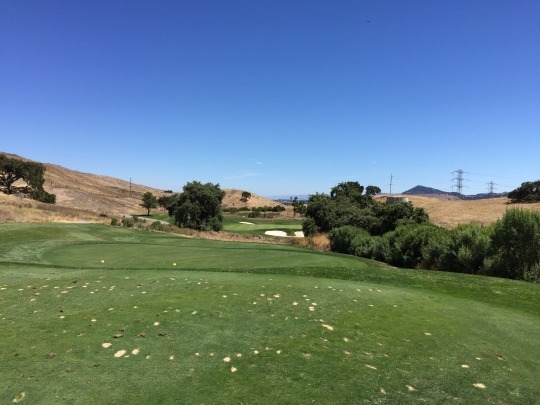 However, that freeway is also a bit of a detraction from the scenery and natural sounds of the course. The prices are also on the high side here, especially on the Tournament Course. During the week, deals can be found, but expect to pay a higher rate on the weekend and also expect to see plenty of players out here. 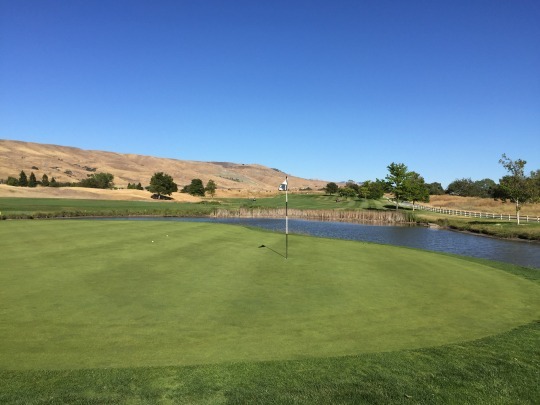 It’s worth a stop, though, and the Tournament Course is definitely the one you want to play at Coyote Creek if you have the choice.